Do you provide customer support as a product owner? If not, you are making a deadly mistake. Let me tell you one thing. The best support method that every customer love is live chat. It has the benefit of getting the solutions real-time on the screen. Being a small scale entrepreneur, you may not have loads of money and coding skill to incorporate a live-chatting solution on your website. Don’t worry! I have an answer for this chaos; that is Lime Talk. Are you a product owner? Do you provide any service? If you have a YES for any of the questions above, I am sure you own a website for your business (in case you don’t, start developing it right NOW). Let me ask you one question. 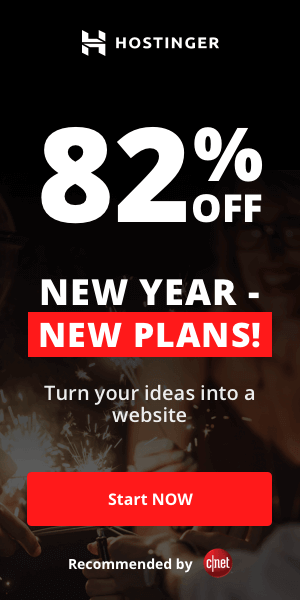 Why did you start a website for your business? To showcase your service or product, to let the audience know the need for your product and to have an extra edge you get by embracing the digital world. Yeah, but a business website have yet another significant function, that is to provide customer support. Before I introduce Lime Talk to you, I have another question. Do you provide customer support as a product owner? If not, you are making a deadly mistake. Let me tell you one thing. The best support method that every customer love is live chat. It has the benefit of getting the solutions real-time on the screen. 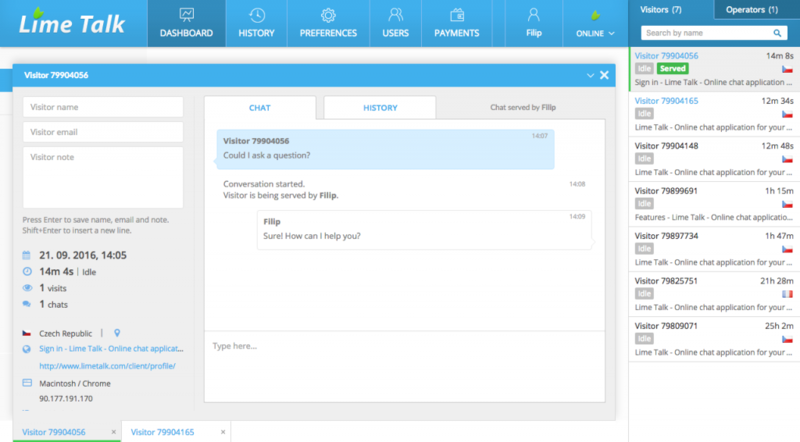 That’s why a large percent of consumers like to seek the support via the real-time chat option. Being a small scale entrepreneur, you may not have loads of money and coding skill to incorporate a live-chatting solution on your website. Don’t worry! I have an answer for this chaos; that is Lime Talk. 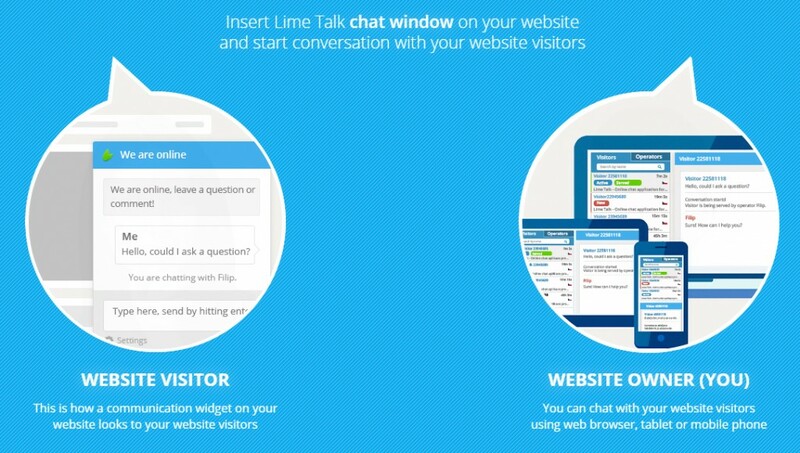 Simply put, Lime Talk is a live chat solution for every website. Without much a do, let’s have a look at the features of Lime Talk. 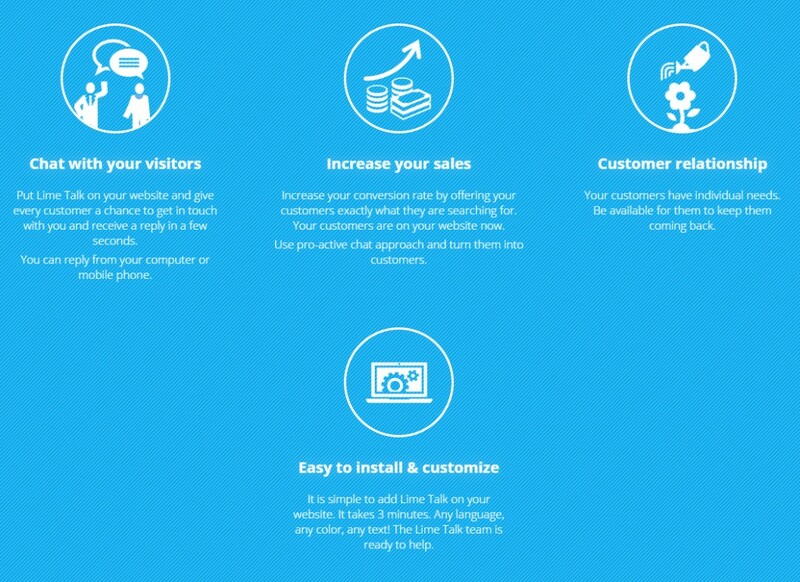 The following are the features of Lime Talk which I found enticing as a website owner. You can’t see this feature in all live-chat software. You can literally track every activity of your website visitors. 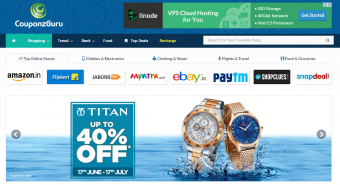 It helps you understand which page they are interested in or what product they are checking out. So, you can tighten your seatbelt to give them a tour of that particular product or service. Apparently, after a few customers, you can even predict what question they are going to ask. If you pick colors that don’t match the theme of your website, for the chat box, no one is going to be interested in that scene, even if you are the best in the quality. Once you choose to go with Lime Talk, you can personalize the colors and style based on the theme of the website to make a flamboyant first impression on your visitors. Lime Talk does provide you some default text for the chat box. 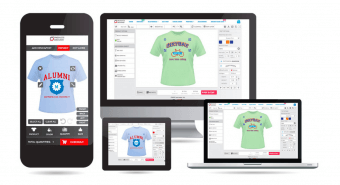 You can change them and replace with most convertible and matching text for your product to increase the sales. You can’t always reply to a customer. On such a situation, making delay doesn’t help either because he will lose the enthusiasm towards your service. 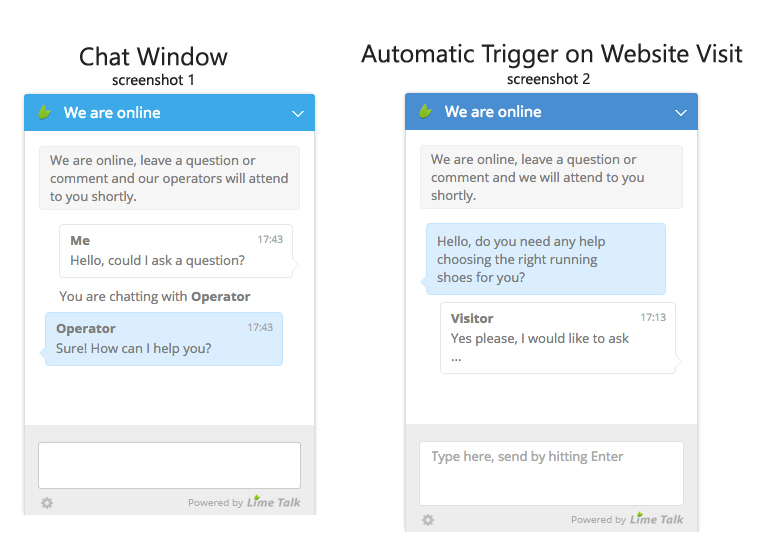 That’s why Lime Talk implemented automatically triggering messages into their eco-system, using which you can set some rules to send automated messages that don’t disappoint your potential customers. Careful selection of the messages and rules look natural to them and, they will stick to your product. Being a non-geeky person, you think it’s a mammoth task to install Lime Talk on your website, don’t you? But your worries have no base! Once you finish all the customization, you will get an HTML code to be implemented into your website. As soon as you apply the code, you will start seeing the chat box. If it is, their WP plugin is going to take over the installation without implementing the code. All you have to do is entering the API. Don’t worry! They will give you free installation if you place an order equal to or above $36. Your business does grow with time and, there will be an increase in the number of customers who contact you via live chat. Lime Talk provides you with the ability to indulge in unlimited conversations per month that your quota will never be burnt out. Concurrent chat means the number of conversations you can do simultaneously. No one can predict how many would be it. With Lime Talk, you won’t be limited in the number of concurrent chats either. If you are offline, you can show the same on the widget itself. Moreover, you can even hide the chat box when you are away. I think the first method is better because in case you get back quickly, you can reply to the queries. When you are not using the client panel of Lime Talk, you don’t know whether you received a message or not. But desktop notifications make it possible and, you can respond as soon as possible. Typing indicator is what we see on most of the IM services. One can know whether the person on the other end is typing or not. Lime Talk gets you this feature as well. For a single operator, Lime Talk has 4 plans. The specs are the same and the only difference is in the number of months you get to use the service. In case you want to increase the number of operators, the prices are really affordable for the huge palette of functions they provide. You have got everything for a shoelace budget. I doubt the presence of another live chat solution for this price. As I said earlier, you get tons of features and, ability to manage your customer queries from your computer and mobile as well. You don’t even have to worry about the installation as they will do it for you. Being a WordPress user, I appreciate their effort to make a plugin for WP.